Kayla Jewel Gillies: Special Moment! OK - So yesterday for the very first time Kayla learned how to bat objects!!! So cute! I have been trying for weeks to interest her in toys and stuff - hoping to entertain her some how when she gets really stroppy, but she would never really take much notice and would get more enjoyment out of staring at the ceiling! lol! But yesterday I had her in her rocker and she got very cranky because she was due for a feed and nap! She chucked a tanty and threw her little arms up in a strop and accidentally bumped the little mobile that was hanging off it. The look on her face was like 'ooooo I can move things!!!' And then she became very curious and started banging it deliberately - she was so excited by it! So I immediately grabbed the camera and started filming! Unfortunately - I hadn't emptied the images in my camera for a while so the film kept cutting out due to the memory being full. So I would take a little snippet - then quickly delete something to make room for another little snippet etc. So I've added 3 videos of the little snippets I got! Isn't she just the cutest???! Gosh I love it when she discovers new things!! We're really starting to notice what her likes and dislikes are too. Though there is not a lot she dislikes at the moment - but one thing I know she hates is having her feet tickled! But the things that she loves that make her laugh is having her chubby cheeks grabbed at and having her lips tickled. By lips tickled I mean when you nuzzle the dummy or bottle up to her mouth she giggles because it tickles her. It makes her smile every time!! The link to it is HERE if you want to check out what I'm talking about. This Hippo is a part of a group of cut out animals located just above the change table. She hates getting her nappy changed - so it's a perfect little distraction to keep her entertained while we change her. I don't know what it is about this Hippo - but there is something about it that calms her right down!! When ever she starts screaming with colic or any other problems she has, all we have to do is show her the Hippo and she will just stop and stare in awe! It's funny because there are heaps of other animals there too - but she doesn't care for the others. It's just these too that she loves - it must be the colours or something! This is a pattern on our curtain in our room. There's just something about this image that she is mesmerized by! When I put her down for naps in our bed sometimes - this picture always has to be in her view or she'll cry if she can't see it! She'll even try and force herself to stay awake just to stare and smile at it all day! So I think it's pretty safe to say that her favourite colours are blue and orange! And funnily enough they are my two favourite colours to dress her in because they suit her so well and light up her face! I can't wait to see what she'll discover next!! By the way - I've been posting quite often lately so you may not have had a chance to see my last couple of posts! If ya haven't seen Kaylas latest photo shoot yet - click HERE. Also if you haven't seen her little comic strip yet either - click HERE! (Or ya can just scroll down! :-)) They are really cute! No really she is just a doll. I am so happy for you two. That is so cool that she's learnt to hit her mobile! It's so funny how the littlest things are so amazing ay! I still remember when Bonnie first started waving her rattle toy around, I thought it was such the bestest thing ever! 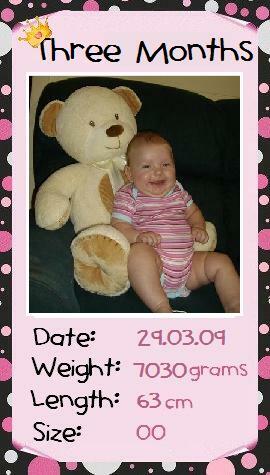 (She never had mobiles so missed out on that milestone moment that Kayla has just had). And, yea, I read this yesterday and just remembered today that I forgot to comment! Oooo, I'm getting forgetful and naughty! Bonnie even watched the videos with me and we watched the bunny rabbit song on YouTube which she really enjoyed and got excited about :) Everytime Bonnie see's a baby on the computer now she says 'Bubba Kayla!' It's nice cause when they do meet one day Bonnie will know exactly who she is! I'm kinda dreaming at the moment but have decided I'd like to have another trip to Townsville in about 2 years, when baby number 2 is about Bonnie's age now, 1.5yrs old. But will really have to see how finances are then! We'll see. I thought BonBon would like the Shnuffles vid! That's sooo cute that every baby is Kayla to her! LOVE IT! !